New Orleans is no-doubt a city of culture, one that offers art and music galore, but one of its greatest contributions to global history is memorialized in the depths of the Warehouse District: the Higgins Boat. As the 74th Anniversary of D-Day dawns, it’s time to pay homage to the boat that changed the face of the world’s most impactful war. 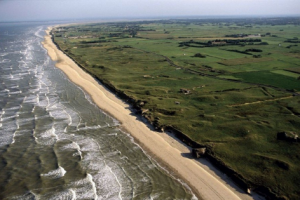 The span of Omaha Beach where part of the D-Day invasion took place. Born at the tail end of the 19th century, Andrew Jackson Higgins was a man ahead of his time. A Nebraska native and a trouble maker, Higgins was known for fighting, a pattern that earned him multiple suspensions form school and eventually expulsion. But one thing that always quelled his mischievousness was boats. He began working with boats early on in life, building his own craft at the mere age of 12. It wasn’t until his early 20s that he made the big move down to the Big Easy. Ironically once he moved towards water from his landlocked home-state, Higgins lost his interest in boats and began working in lumber. It remained this way for many years until he discovered a problem with transporting timber through the shallow swamp waters of Louisiana. As a solution to this, Higgins delved back into his boyhood hobby and crafted a vessel that could transport heavy loads in shallow water. These boats were initially called “tunnel stern boats” (or as Higgins liked to call them “Eureka” boats) and began being used heavily for transporting timber throughout the South due to the fact that they could operate in just 18 inches of water. The ability to stay afloat without grounding the propellor made the boats semi-amphibious. With the success of his invention, Higgins decided to open Higgins Industries in the heart of New Orleans and mass-produce his boats and various other water crafts. It wasn’t long after that Higgins’ boats caught the attentions of the military. Beginning first with a contract with the US Coast Guard, Higgins was then contacted by the US Marine Corps who were seeking vessels that could bring men ashore without beaching the boat. After going through several iterations, Higgins created the LCVP (Landing Craft, Vehicle, Personnel) which is the craft we know today as the “Higgins Boat”. Made mostly of wood, with some steel incorporations, the Higgins Boat was equipped with two machine guns and the ability to carry 36 infantrymen and up to 8,000 pounds of cargo. But most famously, the boats were crafted with a front wall that could be released to create a ramp for the men to debark the boat upon, safely. It was this innovation that made the D-Day attack possible. Prior to Higgins, infantry were unable to attack on open beaches due to the exposure men experienced when climbing over the sides of military vessels to debark. Contributing over 20,000 semi-amphibious landing crafts by the end of the war, Higgins Industries grew from a work force of 75 people in 1938, to over 20,000 in 1943. Higgins was not only at the forefront of sea vessel innovation, but represented a pioneer for equal opportunity employment, hiring women, minorities, and disabled people to create a diverse and integrated workforce. It is for this reason that Higgins stands as one of the greatest figures in New Orleans history and that the National World War II Museum resides in the Crescent City. He made possible the largest water invasion in history and created protection for the men who fought for our freedom and liberated France on this day. 74 years later we have been given an incredible opportunity to reflect upon the bravery and sacrifice of the American troops and express our gratitude not only for the soldiers but Andrew Higgins and the boat that quite literally changed the history of the world.